Well things didn't get much better with Roxy so after 6 months of trying we finally decided to give her back to the rescue where we adopted her from. She didn't last long before a single woman with another dog adopted her and I hear she's doing well! I'm happy she's finally in a home she can be comfortable in. 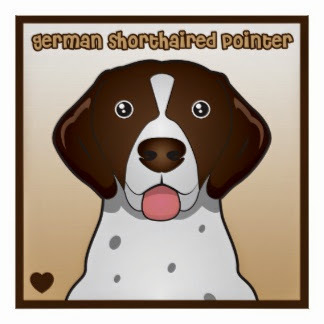 Shortly after giving Roxy up we purchased a German Shorthaired Pointer puppy from a breeder in NC. We couldn't be happier! Bristol is a fantastic addition to our family and fits right in! She's 5 months old now, has been through basic obedience and we're about to start our adventure in Dock Dogs! Today we didn't do too much. We got the lawn mowed by a friend which was a great relief. Then we went shopping at AC Moore and walmart. The kids requested breakfast for dinner so I made fried eggs, bacon and toast. Then we got to cut another chain for the countdown! Love Fridays! The picture is of my tomatoes! Today I won 3rd place in a patriotic crochet contest. I was so excited! I also got our new poster prints in the mail and I love them! I learned that I cannot do laundry in the middle of the day when it's hot out because the hot got so hot and would not cool down. I also learned that if you are waiting on a package then just plan to lounge around in your pajamas and do nothing all day because I got 3 package today! From 3 separate people who all knocked on my door and got ignored since I was in my pajamas! Crazy! Today we went to Joy's for a BBQ lunch and the kids had a great time playing on her new swing set and a water table. That evening I decided to take the kids to Dam Neck beach to see if we could see the oceanfront fire works. When we got on base the parking lot was full so I was excited thinking it would be a good show. We found our spot, I put glow in the dark necklaces on the kids and they placed until the fireworks started at 9:30. As soon as they started Peyton said "I'm bored, can we leave" I made us wait about 20 minutes and then got up to leave. Stoping to take pictures of the moon because it was red! I had to carry Tyler, a large beach bag and a beach chair back to the parking lot. It was 90* and NOT easy. We get to the parking lot and I can't find the van! It's pitch black and people are driving all over the place and there are drunk people falling all over the parking lot. I finally find the van and I think we sat in traffic to get off base for 30 minutes. We didn't get home until after 11pm and the kids were loaded with sand. The fireworks were so far away it wasn't even that great of a show. Definitely not something we'll be doing again! 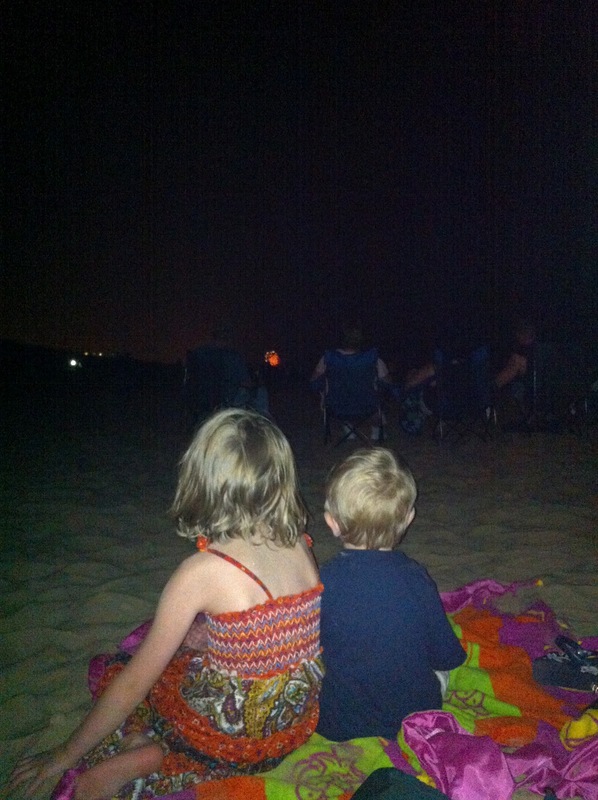 But at least we got to play at the beach, see a red sun and see some fireworks on the 4th. Today hasn't been great. The kids have been fighting all day. Tyler has kicked Peyton in the chest and the nose. Peyton whipped Tyler in the eye with a blanket. They keep arguing over toys, not listening and talking back. Today I tried to work with Tyler on potty training. As soon as we woke up I put him in underwear and made him sit on the toilet every 10 minutes and offered him juice constantly. He sat on the toilet about a dozen times and never went. He ended up peeing on the kitchen floor while he was drinking his apple juice. I put a diaper back on him and I'm done working with him until he shows me some type of interest. On the up side of things I got to facetime with TJ today and talk to him twice on the phone. He sent me several pictures and a video so that sort of made the day better.